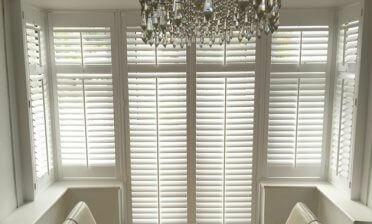 These shutters were fitted in our local area of Bromley to two windows next to each other in this room. The shutters are a great example of our Camber Deco frames which are great for modern windows which can often open inwards. The framing of these shutters look much the same as architraves that surround doorways and help to give these shutters a lovely traditional look. The frames are slim in depth and the fixings are tucked neatly within the frame for the ultimate clean finish. We created these shutters from our Antigua Range of MDF wood which is a more cost effective range but still look fantastic. These window shutters were finished in a silk white paint which works perfectly in this room and match the radiators below. 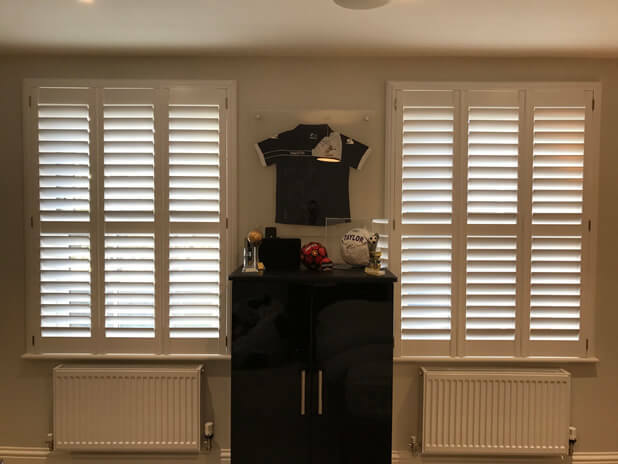 Both shutters feature 89mm louvres with a hidden tilt rod system which allows for all the louvres to be adjusted by touch on each panel. The full height shutters also feature a mid-rail half way which helps to break up the shutters and also gives more flexibility when it comes to adjusting the top and bottom sections. The client was very happy with the finished installation and we think they look fantastic sat each side of the customers sporting shrine and cupboard.